The British cookie that became our family favorite. Despite working at a bakery, my culinary expertise ends at the Pillsbury Ready to Bake cookies. I forget to add sugar to muffins, butter in cookies — I can’t be trusted. Especially around the holidays. Lucky for my family, my sister Anne Marie is the baking extraordinaire. When she was 5 and got her Easy Bake Oven, she quickly got bored because she wanted to make real food. It’s no surprise that she turned into a holiday baking fiend. Pumpkin pie, pumpkin bundt cake, brownie chews, peanut butter kisses, breakfast melts, cinnamon rolls, you name it, she makes it. But it wasn’t until after she spent a semester studying abroad at Royal Holloway University in England that she started making what is now our favorite holiday dessert: the Jammie Dodger cookie. It was after watching the quintessential British show, Dr. Who, that Anne Marie became familiar with the cookie, or biscuits as the British call them. While she was in England, her friends made a huge effort to get her to try popular British snacks and treats such as crumpets, bourbon creams, chocolate digestives and, of course, Jammie Dodgers which are pre-packaged by Burton’s Biscuit Company. Missing her friends when she came home from Christmas break, Anne Marie decided to make the British-themed dessert for the holidays. Although she liked the British Jammie Dodgers, she thought they would be even better homemade. She bought star-shaped cookie cutters — dodgers are traditionally circular — and she used her favorite cookie recipe book “Got Milk? the Cookie Book” by Peggy Cullen for the shortbread recipe. Between the shapes and different recipe, my sister has managed to make this British “biscuit” into an American family’s favorite treat. It was interesting, that first year, to try something we had never heard of for the holiday. But they are absolutely delicious. Nothing is more exciting for me on Christmas Eve than to finally eat a Jammie Dodger cookie and just have that cookie melt in your mouth. Shortbread is such a classic, childhood favorite for so many people — it’s perfect to make for the holidays. Having the jam adds an extra kick to it as well. Although my sister has been making Jammie Dodgers for six years, they continue to be a huge hit. Everyone loves them. Jammie Dodgers are not traditionally made at Christmas, but they have become a Christmas cookie for us. You can make any kind of dessert any day of the year, but not Jammie Dodgers. Since we only make them this one time a year, the excitement that builds up to the actual baking process makes the cookie that much more special. 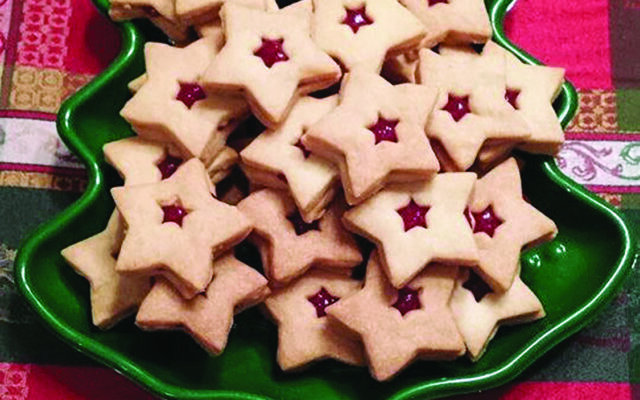 For Anne Marie, making Jammie Dodgers is a reminder of a special time in her life. There are different foods and desserts that she makes for us, but it’s always the ones that everyone enjoys that she’s the happiest to make. I know how much she misses her time over there, so it’s important that we make these because they keep us connected to her friends and a country that we all love during this special time of the year. Jammie Dodgers are pretty simple, they are sandwich cookies made with two pieces of shortbread with jam in the middle. Soften unsalted butter to room temperature. Mix the sugar, vanilla and salt in a large bowl. However, don’t over mix. Sift in the flour, mix and knead it together into a smooth ball. Wrap it in plastic wrap and put it in the fridge for an hour. It should be cold and firm, but not too hard to roll and shape. On a lightly floured surface, knead one section of dough and flatten into a patty with a rolling pin. Once the dough is rolled out, cut the cookies using whatever shaped cookie cutter you like. The shapes should be cut as close together as possible. Press the scraps together, reroll them and repeat. For half of the cookies, use a smaller sized cookie cutter to make an opening in the center. With a flat edge, transfer them all on a greased pan for 20 minutes or until the edges are golden brown. Once the cookies are cooled, it is time to assemble. Take a cookie, put jam in the middle, and place one of the cookies with an opening in the center on top. Enjoy! Use a flat frosting knife to lift the shortbread pieces off of the working surface and onto the cookie sheet. Section off the dough in fourths so that you can knead the dough while the others stay cold. The butter can warm up from your hands, so stick the dough back in the fridge if it gets too soft. Keep flouring the rolling pins, cookie cutters, hands and knife to keep the dough from getting sticky. Use a cooling rack right after they bake to get a more even temperature. If you’re not eating them until the next day, wait to assemble the cookies. The jam causes the cookie to soften, but it’s all about preference (I like eating them that way). Use jam that hasn’t been opened or refrigerated. Cold jam doesn’t mix well with a warm cookie. Have two cookie sheets so that one is already in the oven while you are placing the dough on the other. Only put one cookie sheet in at a time so that the color is even throughout. Use any jam you like. Raspberry is excellent as is black current if you can get your hands on it. You can get some at Bridgham & Cook, Ltd. in Freeport. But red is colorful for Christmas.